Plot An epidemic of mutant monster babies sweeps America. 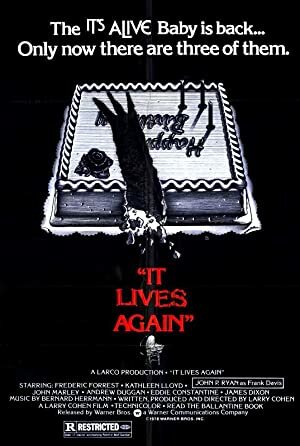 I wondered in the topic for It's Alive if I've ever seen the sequel. Having watched It Lives Again, none of it was familiar to me. That's a shame as I think it's better of the two. I enjoyed the first film, but this picks right up from it and carries on the story and theme. It helps to have John P. Ryan return as Frank Davis and James Dixon as Lt. Perkins. That entire first half hour of Davis convincing a new couple about how their child is in danger and the trouble they go through to protect it was more riveting than anything in the first installment, but it wouldn't have worked without the history of the first film itself. The monster mayhem is restricted to the last half hour and doesn't seem to be nearly as visual in its violence, but it works ok enough considering there are now three mutant babies. The downside is that they all look the same so it may as well have been just one. Also, the third act feels less exciting compared to what came before. Honestly, I thought it was nearly over until I realized there was still another 20 minutes to go. My biggest gripe are the wishy-washy parents (played by Frederic Forrest and Kathleen Lloyd). The mom constantly defends the child until the last moment when she sees it firsthand try to kill someone. All of a sudden, she flips her stance and orders her husband to kill it. I could have done without the "we have a monster baby so our lives are different" speech as it the parental theme turns from subtext to right in your face. Definitely my favorite of the two, but I think both films work at their best in conjunction with each other and serve to create a complete picture. Forgot to mention the callback to Val Lewton's The Cat People was a neat touch.